The hamstrung Weyland Smith from the Franks Casket. Image courtesy of Wikimedia Commons. It’s too hot to sleep. The night is long and empty — what should be a soothing symphony of cricket song and ocean waves, in a place where frogs once sang before pollution stilled their chorus, instead pulls me into a tedium of moonlight and exhaustion. I close my eyes, but my mind won’t sit still. So I leave my bed and my then-husband behind, trying to close the creaking door softly, and pad down the hall. But I’m not awake, either; I’m like a ship anchored far from shore, neither moored at rest in a harbor, nor skipping across the waves toward a goal. I never wanted to move to such an expensive place, across the country from friends, home and my vocation as a scriptwriter. I pace the tiny, gabled living room, unable to just settle down and read. My thoughts drift… and end up nowhere. Something holds me back, beneath the attempts to unwind, as I make tea in the too-narrow galley kitchen. My Gods I am so angry! — this stiffness in my whole back, a ragged edge to my breath, hands clenched around a cup of steaming tea, the heat and green leafy aromas and honey of which cannot soothe this edge off — and it shakes me realizing this. I blink and start awake. My vision is blurry with more than sleep. I feel the good, sound weight of the sofa underneath me. Cold, soft moonlight. It’s not the wind but the sea I hear …. But it is the wind I hear, the same wind that stirs the great body of water also sways the branches outside, which throw dappled shadows across me. My eyes are wide open: and yet, I’m still aware of the Tree, of the young, lean and muscular man who leaps lightly down from a thick branch to face me. I don’t recognize this God. If a God he is. The scale of him, his whole demeanor, seems more human, somehow, than any deity I’ve met. As if he is both a man and a God, but no less a God for it, and this puzzles me. His voice is not the deep grind I expect of those muscles: it’s lambent, alive, and it draws me like a hearth on an oppressive night. I do so, slowly, blinking back the tiredness that fogs my vision. Curtains and walls. The sofa I’m sitting on. My legs. The floor. My cat sits watching me, calmly, and there’s something … not a shadow, a sort of faintly shifting darkness, a non-light that wavers across her. It’s not something bad, it’s just there. I see him. Blue eyes, serious. Pale like a crisp December morning. Heavy gloves. Boots. Rough leather, made for work. They remind me of steel-toed boots. They are steel-toed boots. — I still see a young man, gripping his hammer surely, see the anvil beside him, so ancient it has sunk deep into the mossy roots at the base of the powerful ash tree soaring behind him. The sun gleams through the leaves of the World Tree. But my eyes are open — I am wide awake, and it’s still night. My living room is still there, too, solidly around me. There is nothing about Weyland that pulses red with the violence of his tale, not toward me. He is instead intent, serious. He will never hurt me and would never hurt me, whoever he may — or may not have — hurt before. It’s there in his eyes. He lays me on his anvil and works at my body as if he is shaping and polishing solid silver and gold. It’s a weird experience but nothing about it is creepy. It doesn’t hurt at first, although I feel the ringing of each hammer strike (they echo in my chest), and with each blow feel something in me shift. Weyland strikes through parts of my body with a pick, and I feel the hard surety of his anvil beneath my shoulders, just as I feel that pick lodging into something and chipping it away. He blows and rubs on other body parts, taking great care to lift up and turn each side of my hands, examining the joint of every digit. I don’t know how long this process takes. Is it minutes or an hour that I lie there, both in the waking world and Weyland’s realm? I only know that it takes time. He does not hurry, nor does he speak as he labors. Occasionally, he pauses, examining and adjusting his work. I think that he’s finished. Then he picks up a chamois burnishing cloth and polishes my eyeballs. I flinch and whimper — the static, the pressure! — and when he tilts my head up to examine his work, I realize that I’m not going blind. I get the feeling that if I wasn’t in so much pain right now he’d be humming. Because he clearly enjoys seeing the results of his work, like a masseur working out deep muscle kinks. So I take a few deep breaths and make myself sit still, remembering to blink when my eyes tear up. Somehow, he presses the cloth around the back of my eyes, rubbing all sides, stroking the nerve protected deep within my skull. I feel the chamois there — how can you feel something rubbing in a place where no sensation is supposed to exist? Somehow, it whisks a dulled surface away, leaving the chamois smudged and my eyes feeling clean and tender. I start, because he’s in a yellow welding suit now, the reflective visor flipped back, the heavy fireproof gloves of a modern workman. Not how I usually see Norse Gods. He could be any of the young men who walked off a shipyard, away from the grease and powdery flash-burns darkening metal, the soldered-in bolts cooling on a factory line. He could be one of my relatives. The anvil is gone. His hair has gone pale in the moonlight like the flare of an acetylene torch. Weyland’s smile lengthens, and he doesn’t relent. The burnishing cloth goes through my ears, down through the drums and into the spiraling cochlea, pulling out things that look like metal shavings, black and twisted and ashy. They swirl away when he blows into the canals. He tugs at my fingers and toes, massaging and clearing the invisible channels that run within the heart of my palms, the soles of my feet, working from the base to the tip, slowly rubbing out any aches he finds with the devotion of a master sculptor who is re-forming my flesh. At the end of it I’m exhausted, sprawled on the couch. “You can sleep now,” he says, by way of goodbye. He flips the visor down — is he saluting me? — and hefts his tools. Wait! I cry, sitting up, for like a dwindling torch flash, both Weyland and the World Tree are fading back from my awareness into the prosaic living room I’m sitting in. How can I thank you? The words stall before they can even hit my mouth. He’s gone. But that’s not all he said. In the way of Gods, what Weyland actually said was something else entirely, a personal and specific meaning with an unspoken God’s name implied. I knowexactly whose name is implied, but I’m more puzzled than annoyed. Boyfriend? Since when do Gods have ….? I shake my head, as I lumber back down the hall, to sleep. Gods, do I need sleep! Böðvildr in Weyland’s smithy by Johannes Gehrts. Image courtesy of Wikimedia Commons. At first, the change in me was subtle. For weeks, I had no idea why Weyland had picked that night to help me. I only knew hehad. I didn’t even realize what the Master Smith had done, until the painted icons began exploding out of me that summer, at a skill level I’d never had before — despite all my years of professional training. My vision, in trance, was keener too. My journal entries gained a coherence born of sharper detail and memories of my shamanic adventures. What strengthens the body strengthens the soul and will. In my experience, the strengthening of physical sight and development of close observation, the foundational tools of art, lead to a deeper clarity of shamanic sight. For art itself is a magic act. What once existed in spirit comes forth into the physical world through our inspired imagination and our skilled hands. Artisans, smiths and shamans were once, like the Norse sacred-song mastering galdr chanters, considered potent agents of magic. The Smith as Master Shaman, Healer, Initiator and re-forger of the mortal soul is woven throughout shamanic and esoteric lore the world over, wherever Smith-Gods are found. The eerie experience I’ve described, quite unknown to me at the time, is recorded elsewhere. Anthropologist Mircea Eliade writes several pages on the Sacred Smith in his seminal work Shamanism: Archaic Techniques of Ecstasy; similar experiences are also recounted by modern practitioners of the Norse shamanic art of seidhr. In an over-commodified world, where the rights of both creators and workers have steadily eroded, Weyland is an apt God for anyone who seeks to avoid exploitation, particularly an artist or maker. The modern expression ‘starving artist’ had no place for much of history, when skilled artists of all kinds were sought out and paid well for their craft by temples, rulers and merchants. You honor Weyland Smith by showing pride in your own work, whatever your trade, and by offering fair compensation to artists and workers for their training, skill and the hard work of their two hands — regardless of where they live. For those who want to know more, Weyland’s story can be found in Scandinavian tradition within the poetic Edda as the Lay of Volund and in the Norwegian heroic cycle of Thidrek’s Saga. Norse lore speaks of him as an ‘Elf Prince’, illuminating the ambiguity of his divine but human nature, as Elves are ancestral beings who are kin to the Gods … if not sometimes Gods themselves. German lore portrays Weyland as the son of the half-Giant Wade (also known to the English) and grandson of the sea Giantess Wachilt. 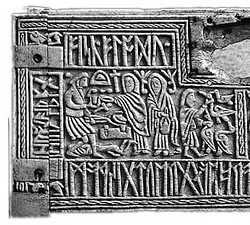 His tale is also told in visual form on Viking picture-stones and a medieval artifact known as the Frankish Casket. Whatever his roots, Weyland the hero is more than human, and treated as a God by many moderns worshipers following a Norse path. In surviving English folklore, he is associated with Neolithic sites, stone ruins and old Roman roads, particularly an ancient barrow called ‘Weyland’s Smithy’ which lies along the ancient Ridgeway road, close to the white chalk Uffington Horse in Berkshire Downs. He and his family were well-known and honored in both England and the Continent, with many surviving place-names referencing both Wade and Weyland. Medieval Smith’s workshops were called ‘Weyland’s Houses’. In Denmark and Iceland, the plant Valerian is named ‘Veland’s Wort’ for him. As the Master Smith and maker, whose name was used to denote the finest of works, he has similar cultural significance to the Finnish God-hero, the smith Ilmarinen (a major character in the Kalevala poetic cycle), the Greek hero Daedalus (also a widower and maker of wings imprisoned by a king), and the lame God of Smiths, Hephaestus. His ties to healing, craftwork and inspiration also link him to the Celtic Brighid. Many fabled master swords and items of armor are said to have been forged by Weyland, including the mail shirt worn by Beowulf and Sigmund’s sword, Gram, given to him by Odhin. 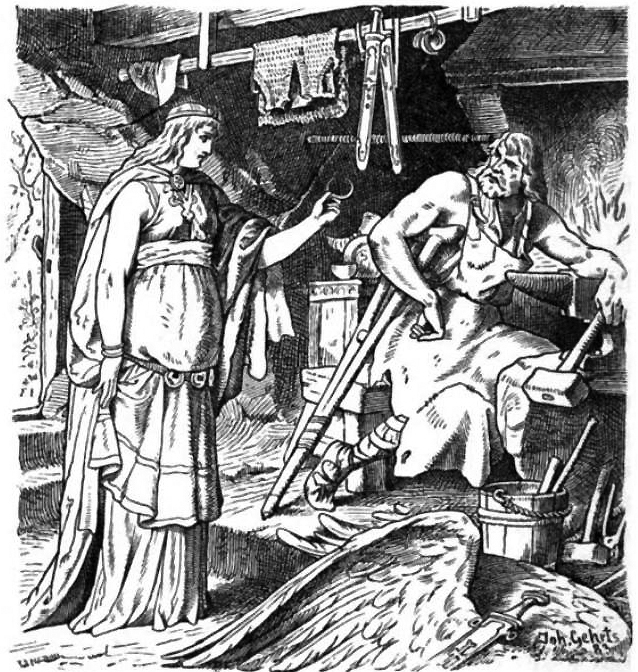 Weyland’s tale also bears some similarities to one of Odhin’s exploits, the winning of the mead of inspiration; his relationship to his wife Bodhvild is very similar to Odhin and the Giant maiden Gunnlodh, whose uncle worked Odhin like a thrall, according to Snorri Sturleson’s Prose Edda. Odin’s tale also involves alcohol, a heartbroken abandoned maiden, and a rapid escape in winged form— as an eagle. Interestingly, Weyland is also depicted as an eagle in the oldest known form of the story, the Viking-era Ardre Image Stone, found in Sweden. Carolyne Larrington, (translator). Oxford World’s Classics, 1996. Seamus Heaney, Beowulf: A New Verse Translation. W. W. Norton, 2000. Keith Bosley, (translator) The Kalevala (compiled by Elias Llönrot from Finnish oral tradition). Oxford University Press, 2008. Mircea Eliade, Shamanism: Archaic Techniques of Ecstasy. Penguin Books, 1989. Snorri Sturleson, Jesse Byock (translator) The Prose Edda. Penguin Books, 2005. Jacob Grimm, Teutonic Mythology, Vol. I, pgs. 376-378. Google Books, (accessed 2012). Hilda Ellis Davidson, Gods and Myths of the Viking Age. Barnes and Noble, 1996.
http://en.wikisource.org/wiki/1911_Encyclop%C3%A6dia_Britannica/Wayland_the_Smith (the 1911 Encyclopedia Britannica article, accessed 5/26/2014).